It seems that similar conceptions of an armored tractor were shared early in the war by both allies. 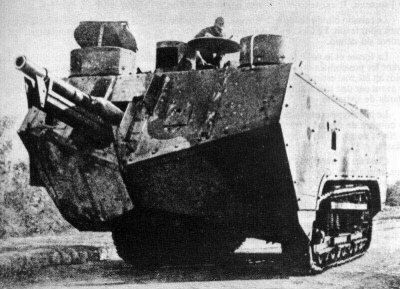 On the French side, Colonel Estienne, a renowned military engineer and successful gunnery officer, studied in 1914 the idea of an “armored transport” able to carry troops through no man’s land. After some trials in Great Britain, he saw the new Holt tractor (largely in use for towing artillery) as an opportunity to develop his ideas. The Fouché prototype was an early forerunner, the Number 1 Type C. It was designed and tried as soon as February 2-17, 1916. This was basically a lengthened Holt chassis (1 meter with an extra bogie) wrapped into a makeshift boat-like structure. The front design was meant to cut through barb wire and possibly “surf” on mud. It was unarmed, made of wood and open-top. Trials were organized with Louis Renault, the car maker, and two officers, De Bousquet and Cdt Ferrus. Most of this experience was later passed onto the CA-1. Among other projects, the Char Frot-Turmel-Laffly was tried in March 1915 and rejected by the commission. It was a 7-meters long armored box, based on a wheeled Laffly steamroller, and propelled by a 20 hp engine. It was protected by 7 mm (0.28 in) of armor, up to four machine-guns or more, a crew of nine, and a top speed of 3-5 km/h (2-3 mph). The same year, the Aubriot-Gabet “Cuirassé” (ironclad) was also tried. This was a Filtz farm tractor equipped with an electric engine, fed by cable, and equipped with a revolving turret housing a QF 37 mm (1.45 in) gun. By December 1915, another project by the same team (this time autonomous with a petrol engine and full tracks) was tried and also rejected. Another engineer, from Schneider, Eugène Brillé, had already started work on a modified Holt chassis. After political pressure and final approval by the head of staff, Schneider Cie, by then the biggest French arsenal, started work on the Schneider CA-1. But because of administrative mismatches and Schneider reorganization for war production, the CA-1 production (then assumed by a subsidiary of the firm, SOMUA) was delayed by months. By April 1916 when the first were delivered, the British had already thrown in action their Mark Is. The surprise effect was mostly lost. Losses were enormous, but this is more due to General Nivelle’s poorly coordinated plan and the lack of reliability of this first model. Many Schneider tanks simply broke down or bogged down on the way. Others were picked up by German artillery. The Schneider CA-1 was an arsenal-built model and the later Renault FT was a car company product. But by 1916, the Army wanted its own project, which became the Char Saint-Chamond. The St Chamond, developed in parallel to the Schneider CA, was also based on a modified Holt chassis. It has a far bigger hull, to fill the Army’s requirements for better armament, in fact becoming the most heavily armed tank of the war on the Allied side, with a QF 75 mm (2.95 in) field gun and four machine-guns. But its longer hull proved to be its demise. It was more prone to being bogged down than the Schneider, and consequent operations had a huge attrition rate. Consequently it was mostly relegated to operations on better terrains, easily found during the last stages of the war, after the stalemate was broken, or relegated to training. The Saint Chamond could have been rated as a heavy tank as well, but it was not the case in French military nomenclature. 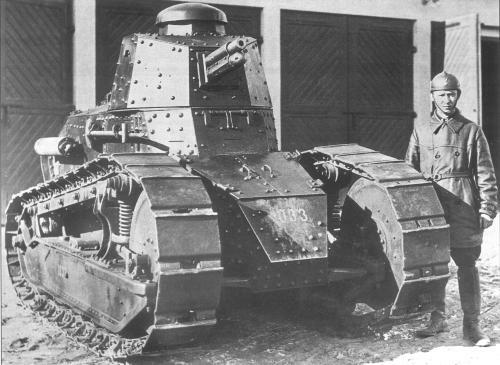 By 1918 this kind of tank was considered obsolete, although possessing some interesting innovations. The famous FT (a factory serial designation without meaning), was born from Renault’s ideas for mass-production, General Estienne own concept of the “mosquito” tank fleets, and the inspired pen of Renault’s chief engineer, Rodolphe Ernst-Metzmaier. It was really a breakthrough, an historical landmark. The vehicle was small, but not cramped (at least for the size of an average Frenchman, recruited largely from the peasantry). It was organized in a new way, now mainstream: The driver at the front, engine at the rear, long tracks and a central revolving turret housing the main armament. Light, relatively fast, easy and cheap to built, declined in gun and MG armed versions, it was turned into the thousands in 1917-18, widely exported and produced under licence for years. 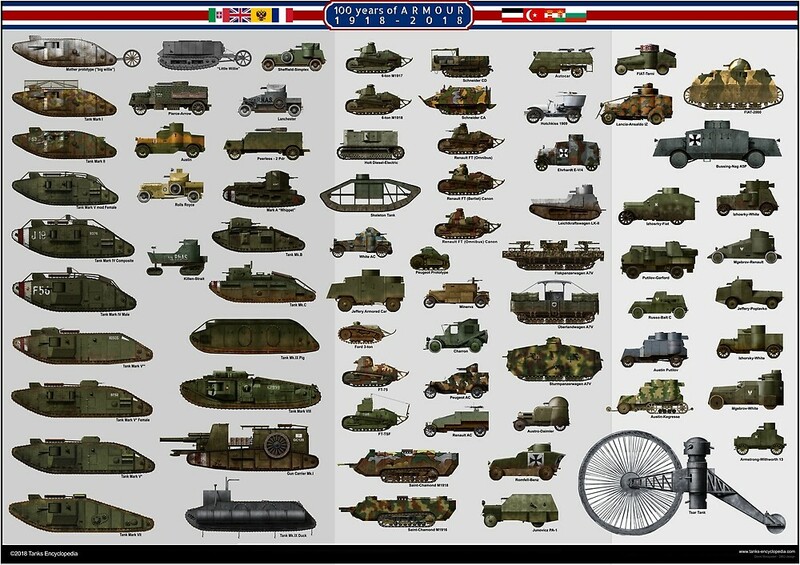 It was the first American tank, first Russian, first Japanese, and first of many other nations after the war. The Italian FIAT 3000 was largely inspired by this model. Other projects were on their way in 1917-18, but never did it, or after the war. Saint Chamond, for example, worked on a new model largely inspired by the British rhomboid style hull, but with a fixed superstructure at the front, and later a revolving turret. It stayed a paper project. The FCM-2C (Forges et Chantiers de la Mediterranée) was another project from Estienne, a “land-cruiser” designed to operate breakthroughs in the most difficult and heavily defended sectors. It was ambitious, with several turrets and a crew of 7. Perhaps overambitious, as the Mediterranean shipyard dragged on to produce a single prototype. 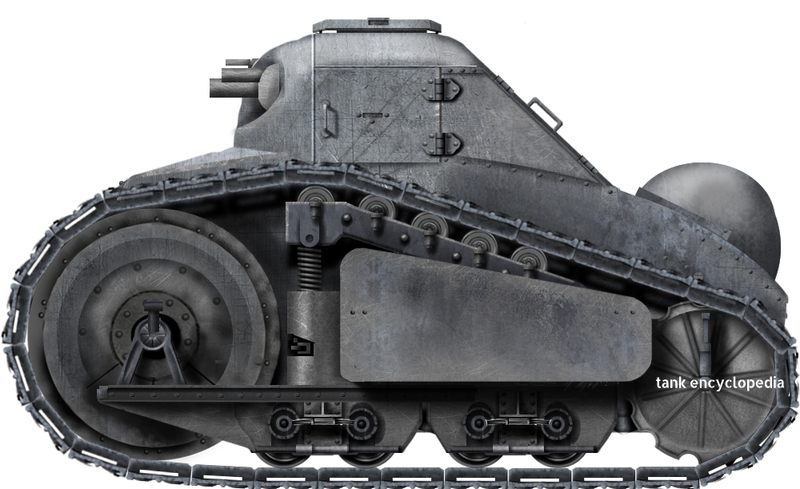 Eventually a serie of 10 “super-heavy tanks” were built in 1920-21, propelled by captured German Maybach engines. 400 built, one 47 mm (1.85 in) SB field gun in barbette, two Hotchkiss machine guns in sponsons. 400 built, one hull mounted 75 mm (2.95 in) field gun, 4 Hotchkiss machine guns in sponsons. 4500 built, one 37 mm (1.45 in) SB Puteaux gun or one Hotchkiss 8 mm (0.31 in) machine gun. 20 built, one 75 mm (2.95 in), two 37 mm (1.45 in) guns, four Hotchkiss 8 mm (0.31 in) machine guns. around 16 built, one Hotchkiss 8 mm (0.31 in) M1902 machine gun. 270 built, one 37 mm (1.45 in) SB Puteaux gun or one Hotchkiss 8 mm (0.31 in) M1909 machine gun. Unknown number built, one 37 mm (1.45 in) SB Puteaux gun or one Hotchkiss 8 mm (0.31 in) M1909 machine gun. 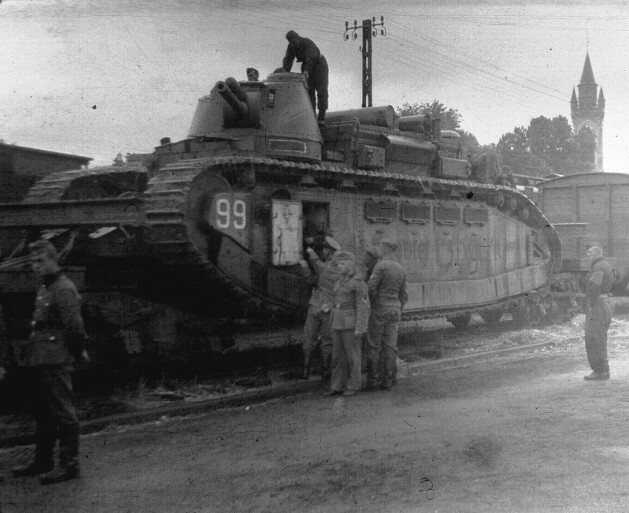 The Schneider CA-1, the first French operational tank. Due to its design being closely based on the “long” Holt Chassis, the large, angular hull was prone to bog down and poor maintenance and average training proved issues as well. Like British tanks they suffered enormous casualties due to German artillery fire and gained the nickname of “mobile crematoriums” because of the exposed fuel tank. By late 1917, all existing CA-1s had been limited to training purposes only. The Saint Chamond, produced by the army with army specifications, was the most heavily armed and impressive tank of the Allies, but proved completely unreliable in the field. With the same, lengthened Holt chassis and an even longer, protruding angular hull, the Saint Chamond had even poorer mobility than the CA-1 from Schneider. Serving officers, after many crew reports, even complained on this matter to the national assembly, which led to an official commission of inquiry. However, on relatively moderate ground, they proved efficient, with speed better than usual (7.45 mph / 12 km/h). Some advances features like its Crochat Collardeau electric transmission proved somewhat unreliable in real combat conditions. The famous Renault FT. By far the best of the three designs launched during the war, it was revolutionary, featuring many characteristics still in use on modern tanks to this day. The FT was also the most produced tank of the war, surpassing by far in this matter any contemporary tank. Marshal Joffre imagined an assault with perhaps 20,000 FTs in early 1919, which was intended to open the way towards the heart of Germany. This little fellow was Peugot’s competitive answer to Renault, a sign it would, as well, join the war production effort with the same minimalist approach took by General Estienne for hi “swarms of mosquito tanks”. It was designed by Captain Oemichen, an engineer from the Special Artillery branch of the French military. The Peugeot tank was indeed a small machine at 8 tons, with the driver (right) and gunner (left) seated in échelon, side by side, in a fixed superstructure. The whole upper front section, from the engine to the roof, was one solid cast block, sloped and thick. There were access doors on the sides and rear of the superstructure. The armament consisted of a single 37 mm (1.46 in) standard short-barrel SA-18 Puteaux gun ball-mounted and offset to the left, although other sources state it was a 75 mm (2.95 in) BS howitzer. The suspension comprised two pairs of bogeys, leaf and coil springs, plus an upper protection plate for the most sensitive part of the wheeltrain. The upper part of the tracks was supported by five return rollers. The engine was a current Peugeot gasoline model, probably serial 4-cylinder. 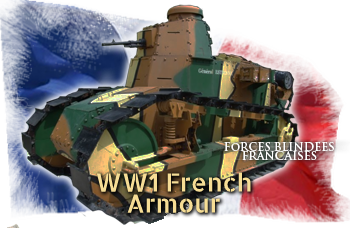 Released in 1918, it successfully passed evaluations, but since it did not bring anything new the Renault FT wasn’t already providing, the program was cancelled. Weighing nearly 70 tons, studied and developed since 1916 at Forges et Ateliers de la Méditerrannée (FCM), the Char 2C was another long wanted army project, a super-heavy tank. It was intended to be able to deal with the most fortified German positions and recapture forts of the eastern border. But the development of such an advanced model was initially so slow that the project was taken over by Renault’s chief engineer Rodolphe Ernst-Metzmaier and General Mouret’s careful and personal involvement. 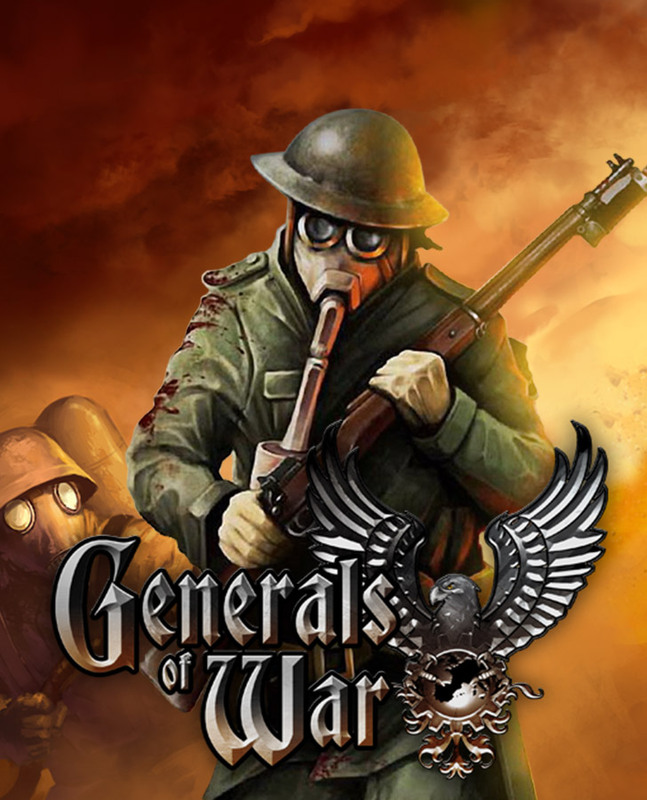 They were operational by 1923. The original order of 200 was cancelled after the 1918 armistice. GREAT SITE want to purchase most of your posters how do I order???? the encyclopedia is missing out alot of tanks for this branch.